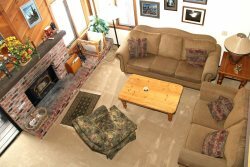 Nice One Bedroom & Loft & Two Bath Condominium in the Scenic Meadow Area of Mammoth Lakes. Sleeps up to 6 (approx.1100 Sq. Ft). Pet Friendly. You walk up one flight of outside stairs to enter the unit. This spacious 2 story unit has vaulted ceilings. Corner unit is bright with lots of windows to let the light in and has a great view. The first floor is the Master Bedroom, Kitchen, Dining Room, Living Room and 1 Full Bathroom. The second floor is the Loft and the 2nd Full Bathroom. The Loft is open to the living room by a half wall. The Master Bedroom has 1 King Bed, the Loft has 1 Queen Bed and there is a Queen Foldout Couch in the Living Room. There are 2 TVs (Including a Large Flat Screen in the Living Room & 1 TV in the Bedroom), 2 VCRs, 1DVD, and CD & IPod Docking station. Wireless Internet in unit. This cozy unit is tastefully decorated with mountain cabin style furnishings and chefs will enjoy the nice, well stocked kitchen. There are two outside parking spaces available. Sunrise Condominiums offer a Spa, Seasonal Swimming Pool and Sauna. Coin-operated laundry facilities located in the common area near the office. COMPLIMENTARY INTERNET and CABLE TV are provided, however NO REFUNDS will be given for connectivity problems or Internet failure. TOT LICENSE 807-SR03. Super clean condo with a fantastic view. We stayed here over a busy holiday weekend. It was nice to be away from the craziness in town, yet we were a 3 minute drive from Little Eagle and a 2 minute drive from Vons. The view of the mountains was an unexpected plus....just beautiful. We would stay here again. We had a wonderful week in this unit - it couldnt have been better. We will definitely be renting this unit again next summer. We really enjoyed our stay at SR03 especially our 8 year-old who was able to sled right outside our unit. The kitchen was well stocked with everything we needed and the unit was very clean. The nice surprise was that the unit had access to sleds and shovels but we did not know about it. Maybe it was on your website, but if you put a reminder in your reservation confirmation or during check-in it would be a great savings for your customers. Other than that, it was great and we hope to go back next year or sooner. The on site manager was a gem. The unit was well stocked and we had a lovely stay. An 7.5 out of 10 stars. My husband and I truly enjoyed our stay at the unit #3 of Sunrise. We like the unit with beautiful mountain view, well equipped kitchen, and comfy bed. Also, we like the residential manager who was very helpful and the booking staff, Michelle, who was helpful and courteous. So, we probably will be back in late Spring or summer. Thank you for your interest in our input. We truly enjoyed our stay at Sunrise Unit #3. The unit was clean, well maintained and nicely appointed. As always the staff at your office and on site were extremely courteous and helpful. We hope to return again this season. Always great service to talk to Michelle and Caroline in the office. Very helpful and patient. Have stayed in several of the units but our most favorite so far is Sunrise 3...unit was extremely clean and well stocked, especially kitchen, with everything we needed to make our stay fantastic. Mike is awesome at maintaining the complex, shoveling and blowing snow in the middle of the snowstorms with a smile on his face. Spa and Jacuzzi was immaculate. We found the condo quite comfortable. We appreciated the accommodations the owners made available to us. The beds were very comfortable, (not always the case in condo rentals) Overall we enjoyed our stay very much and will definitely call you again when we decide to visit Mammoth. Thanks! Had a great time up there. Niece Lexi is now a skier! Shes been in Mammoth in both summer & winter and loves it. She particularly enjoys the loft & the view in unit 3.